HÃ¤fele, an international supplier of hardware technology for the cabinet, closet and furniture industries, will showcase its interpretation of "dream rooms" at interzum 2011, May 25-28, in Cologne, Germany. HÃ¤fele said the space plans for these dream rooms are flexible, mobile and versatile. At interzum, HÃ¤fele,. 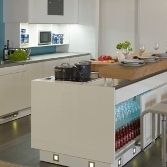 will show how "intelligent hardware technology" can transform a living room into a kitchen, guest room or office. Among the highlights, a dining table becomes a multi-purpose work surface, a coffee table reveals itself as a multi storage unit and a table turns into a bed. HÃ¤fele will display in Hall 7 of the Cologne Fairgrounds during Interzum. In addition, HÃ¤fele will also exhibit at the special presentation for light panel constructions during the Ligna Fair in Hannover from May 31 â June 3 - Hall 24/Stand C19. Read more about HÃ¤fele's plans to exhibit at interzum.